Frankfurt, 18th March, 2014: With the UAE becoming a leading source for petrochemicals and plastics, key regional players are making a beeline to lend their support to a major industry event in Sharjah. As India is focusing on exports to Middle East and Africa most of the big player will be targeting Plastivsion Arabia 2014 as a major event for future to get more export business says Mr. Jayesh Rambhia, Chairman of PVA, he further added we are having some special schemes for SME and MSME’s. They include UAE’s Borouge, Qatar Chemical and Petrochemical Marketing and Distribution Company (Muntajat), and Saudi Arabia’s Sahara Petrochemical, Saudi International Petrochemical Company’s (Sipchem), National Industrialization Company (TASNEE), and Saudi Basic Industries Corp (SABIC). “The biennial Plastivision Arabia had one of the best launches for any show in the region in 2012 – it registered a record number of pre-registered visitors, excellent exhibitor response and good visitor turnout. This grand success was courtesy the emergence of the Middle East region as a key player in the global petrochemicals and plastics industry,” said Mr Saif Mohammed Al Midfa, CEO, Expo Centre Sharjah. 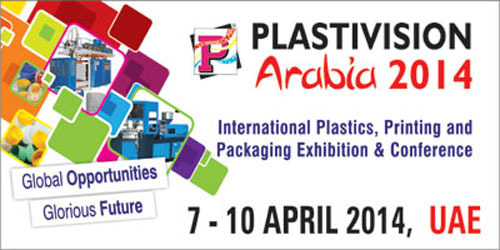 “The rise in the number of sponsors from just one for the launch in 2012 to about six (and growing) for the second Plastivision Arabia shows the impact the event has made with just one edition. Borouge was the Platinum Sponsor in 2012, while we already have six, including Borouge, for this year,” Mr Midfa added. The addition of the International Conference for Plastics Conversion (PlastiCon 2014) to Plastivision Arabia in association with industry body Gulf Petrochemicals and Chemicals Association (GPCA) has also played a key role in attracting leading establishments to support the event. “By focusing on the growth of plastics conversion both globally and in GCC countries and highlighting the key role of innovation in market and product development, the fifth GPCA PlastiCon will be a significant event for the regional industry and add great value to Plastivision Arabia,” said Dr Abdulwahab Al-Sadoun, Secretary General, GPCA. GPCA PlastiCon 2014 will also feature a Gala Dinner showcasing the GPCA Plastics Excellence Awards, which will recognise companies, individuals, academics or students who have displayed excellence in plastic conversion innovation. PlastiCon has received confirmations by Mr Willem De Vos, CEO, Society of Plastics Engineers; Mr Mohammed A. Alazzaz, Director Value Parks, Sadara Chemical Company; Dr Klaus Hecker, Managing Director, OE-A Organic Printed Electronics Association; and Hery Randrianantoandro, Healthcare Segment Leader, Sabic; as keynote speakers. These premier industry events come at a time when GCC’s petrochemical exports are expected to hit a record high this year with the WTO Bali Package set to come into effect. The agreement will make it easier to trade with the developed world, which can lead to a surge in exports from the GCC that stood at 172mn cubic metres in 2012, equivalent to 75 per cent of its output and valued at US$52.7 billion, according to latest reports. According to the Ministry of Foreign Trade, exports of plastics from the UAE grew by 127 per cent (US$2.2 billion) from H1 2011 to H1 2012, eight times larger than the growth rate achieved during the whole of 2011. Plastivision Arabia is organised in association with the All India Plastics Manufacturers’ Association (AIPMA), the oldest and the largest apex body of the plastics industry in India. As in the past edition, the tie-up with AIPMA will facilitate impressive participation from India, while the show has already received good bookings from Taiwan, China, Iran, Turkey, Portugal, Pakistan, UK and Sweden, among others. Visitors can expect to see plastic raw material, plastic packaging machinery & technology, equipment & services, primary processing and auxiliary equipments, equipment for pre-processing recycling, post-processing machines, machinery and plant for finishing, decorating, printing, marking & ancillary equipment. Plastivision Arabia 2014 will be organized by Expo Centre Sharjah, in association with All India Plastics Manufacturers Association, and the support of the Sharjah Chamber of Commerce and Industry. It will be held at Expo Centre Sharjah from April 7 to 10, 2014, and will feature Consultants’ Clinic, Placement Pavilion, Business Opportunity Pavilion, Product Design & Innovation Pavilion and a Green Pavilion. Plastivision Arabia will display raw materials and machinery for key segments such as plastic processing, injection molding, thermoforming, packaging, industrial users, construction, infrastructure, automobile and telecommunication, among others.